The transition from fee-for-service to value-based reimbursement has been a challenge for many providers. Financial incentives that favored high service volumes must now be re-focused to accommodate alternative models such as bundled payments and accountable care organizations (ACOs). The change has led to very real concerns about the loss of revenue during the transition period, putting hospitals and providers at financial risk. Among those concerned was Utica Park Clinic, a multi-specialty physician group in northeast Oklahoma that is part of the Hillcrest Healthcare System. Executives at Utica Park Clinic recognized that the group needed to generate new fee-for-service revenue streams in the short term to make up for the shortfall being created by pay for-performance plans. It also needed to improve the quality of care overall to reduce losses and set the stage for future success by taking advantage of financial incentives for measures such as lower readmissions and improved Star Ratings for several Medicare Advantage. Utica Park Clinic quickly recognized the answer to these and other imminent challenges was population health management (PHM). 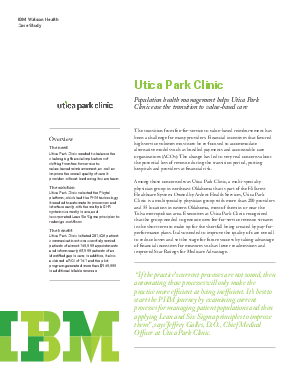 By incorporating Lean Six Sigma principles to redesign workflows and implementing Phytel as its PHM platform, Utica Park Clinic was able to generate impressive results in several areas. Among them was reminding nearly 140,000 patients about appointments, informing 65,000 patients about identified care gaps and spurring 6,800 of those to action, resulting in the generation of more than $840,000 in additional billable revenue in one year as part of a 60-provider pilot program. The total ROI was 14:1, and all PHM efforts are now generating their own funding streams.